FREE Demo version for PC & Mac! 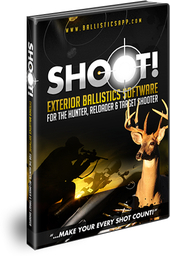 Generate ballistic charts and find ballistic coefficients at the click of a button! Easily calculate the optimum performance settings for your gun/ammo combination. Optimize your gun/ammo combination for any game animal/target size zone up to 20 inches. Store, organize and access all your gun and ammo/reload information fast and easily. Quickly search 8000+ factory loads, bullets, etc for Centerfire, Rimfire, Muzzleloader & Shotgun slugs to use in Shoot! Search over 350+ cartridges and 65 different manufacturers! Calculate what sight adjustments (Clicks, MOA or MILS for elevation and windage) are required to score hits at extreme ranges in ‘Ballistic Report’ mode. Visually compare up to 3 loads – you see the shots on a scaled target image or just graph it. Select Drag Tables to match your bullet profile for accurate long range shooting (G1, G2, G5, G6, G7, G8) and convert ballistic coefficients from one Drag Table to another. Your gun is sighted-in 1″ high at 50 yards. Where will the bullet impact 100, 200 or even 500 yards downrange? Just watch the target image to see where the bullet impacts – even when it is off the target! You can explore the what ‘ifs’ easily and best of all, you see the result. See how your gun performs when velocities are increased, different bullets used.